The use of arch construction has been around since before the Romans made it famous in their architecture. The unique aspect of an arch is that it eliminates tensile forces created when a structure spans a space, such as in an arch bridge. All the forces are resolved into compressive forces that are carried through and arch into an unyielding base. A description of the application of arch theory into soil mechanics was made by Karl Terzaghi (in Terzaghi, Peck and Mesri, 1996) He described the soil arching process as the transfer of pressure from a yielding mass of soil onto adjacent stationary parts. In the case of trench shoring applications, the unyielding parts are the hydraulic cylinders in the trench jacks as well as the bottom edges of the excavation and the inside corners of vertical excavated walls. Aluminium hydraulic shores, or trench jacks, have been used successfully in the USA since the early 1950s. At the time they were a major technological advancement over timber shoring because they could be safely installed and removed from outside the trench, so that workers did not have to risk entering an un-shored excavation, as with timber. Another major advantage is the dramatic increase in productivity which was achieved using hydraulic trench jacking. A 2m deep trench jack can be set in less than a minute with a 2 person crew. Hydraulic trench jacks were designed and manufactured to be re-usable, and hinged so that they could swing into a trench and be pumped out, all from the surface. The original design has changed very little since the early days. Soil arching is the reason that lagging can be removed from a small section of shored excavation wall without the soil behind it flowing out. Arching is responsible for the fact that trench walls shored with trench jacks will stand, even with no sheeting in between the jacks. Soil arching does not reduce the total soil load, it just distributes it to the shoring elements and away from the excavation wall face. For soil arching to work there has to be some very tiny movement of the soil. Trench jacks and even a trench box, which is dug into the ground, will add compressive forces and, thereby, setting up an arched stress path between the supports. 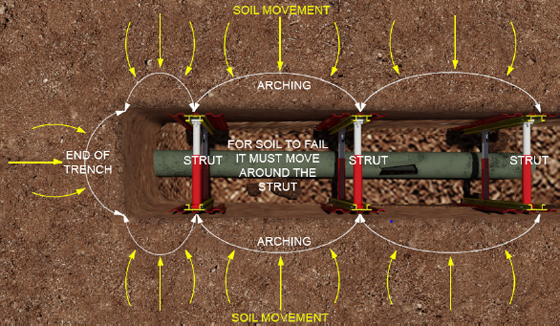 The key concept behind pre-loading the shoring struts is to set up the arching capability, by pushing the soil in slightly without allowing the soil to move outward. An important element of soil arching is the consistency of the soil. Both cohesive and non-cohesive soils will experience soil arching to some extent. But, in order for this type of shoring to be deployed, the trench must be able to be pre-excavated and to stand up while the trench jack system is placed and pressurized. So soils lacking cohesion are generally not good candidates. Manufacturers of these systems will advise on spacing requirements, as well as recommended pre-load pressures, for their systems to be safely and effectively used. The closer the trench jacks are placed the better the system works. Historical use has been limited to spacing of up to 2.4m but, mostly the maximum spacing recommended is 1.5m. A further safety consideration is the use of a minimum of 3 sets of jacks in any excavation. Basic criteria for the system to work well are; the soil is good enough for the trench to stand when excavated, minimum pressure is able to be achieved when pumping out the hydraulic jacks and is able to be maintained, and jack spacing is limited to 1.5m. Some ravelling, or soil falling off the trench face between the jacks, may occur but this will not compromise the system. Some users will elect to use backing boards to reduce or eliminate ravelling. Now, for the first time, hydraulic trench jack systems have been produced using light-weight GRP composite material with aluminium hydraulic cylinders. MGF, a leading UK shoring manufacturer, supplier and hire company specializing in shoring systems, have launched the Gripshore™ range in the UK. The system is now available here in New Zealand through Trench Shoring New Zealand Ltd in partnership with Humes Pipeline Systems and Hynds Pipe Systems.